Since it opened in 1993, the Adventuredome at Circus Circus in Las Vegas has operated with only one roller coaster, the iconic Canyon Blaster. After two decades of successful operation, the park made the decision to add a second coaster to its lineup. Rumors for the new ride began back in late December 2012, where sources revealed that the park may have hired S&S to design a custom “El Loco” style coaster to fit in the Adventuredome, which was confirmed by an article in ParkWorld magazine just a week later. Confirmed in February 2013 for a December 2013 opening, El Loco, would become not only the second coaster at the park but also only the second coaster of its kind in the United States, the other being Steel Hawg at Indiana Beach. After a few delays in construction, the new coaster would finally make its grand opening on February 18, 2014. To make room for their second coaster, the park removed its Rim Runner log flume attraction, situating the groundwork in the location of the rides splashdown pool. 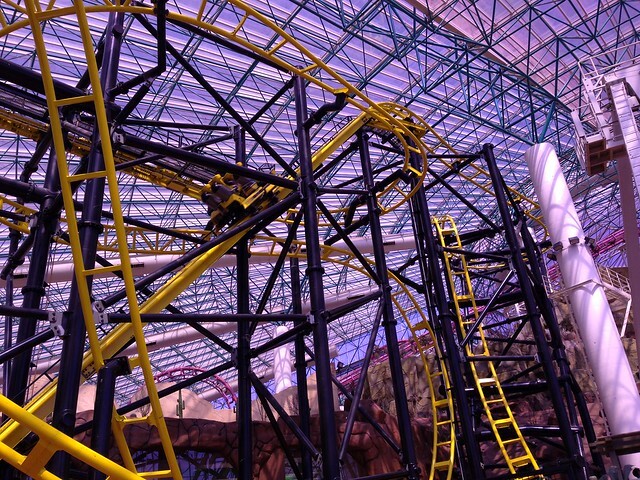 El Loco features many of the same elements as the other “El Loco” coasters from S&S, but many have been modified, reoriented, and customized to fit the smaller footprint of the Adventuredome site. Up to six cars are able to cycle the trackwork at any given time, each one carrying four passengers in open-style cars, outfitted with overhead-lowering lap bars and an onboard audio sound system that allows each guest to listen to their own choice of music, including Rock, Hip Hop, and Latin music selections. Out of the station and bending left, the leg leading up to the lift hill utilizes some of the “rock” structure originally used by Rim Runner. It takes all of 8 seconds to ascend the 90-foot lift, where a small dip and lateral-G-filled rising turn leads to the first drop. The bottom drops out, as the trains pull hard into a 90-degree dive under the lift hill, rolling to the right as it approaches the ground and rising up through a tightly twisted turnaround into a block brake. Running parallel to the lift hill, the track banks and rolls to the left, while the vehicles pulls around to the right under the high point of the lift through a backwards-banked turn. As the turn ends, the track begins to twist and roll to the right as the vehicle turns to the right, ending this turnaround in an inverted position under the block brake. Completely upside down, riders hang for a second before the track curls back under itself through the last part of the “Doughnut Roll.” Bending slightly left, the vehicle rises sharply, nearly vertically, cresting into a right turn into another block brake section. Banking heavy to the left the track turns slightly to the right through another reverse-banked turn, which shifts and rolls into a half barrel roll, followed by 3 seconds time completely inverted and a final inverted drop to the final brake run underneath.